Additional Information Solid gold bar ingot case 5 grams. 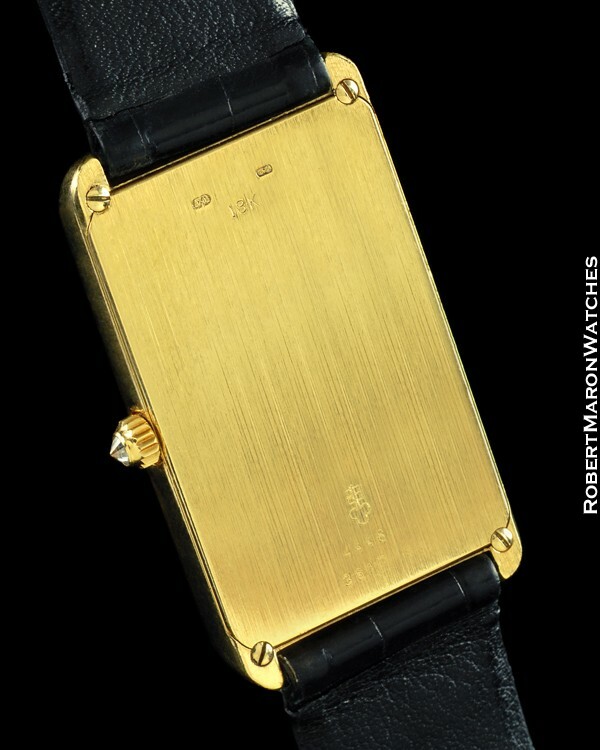 Here is something that definitely does not come around very often… a his and hers Corum 24k gold ingot watch set. Corum used actual 24k gold ingots issued by the Union Bank of Switzerland (UBS) and each ingot has its own serial number and is marked 999.9 to signify that it is 999.9% pure gold. 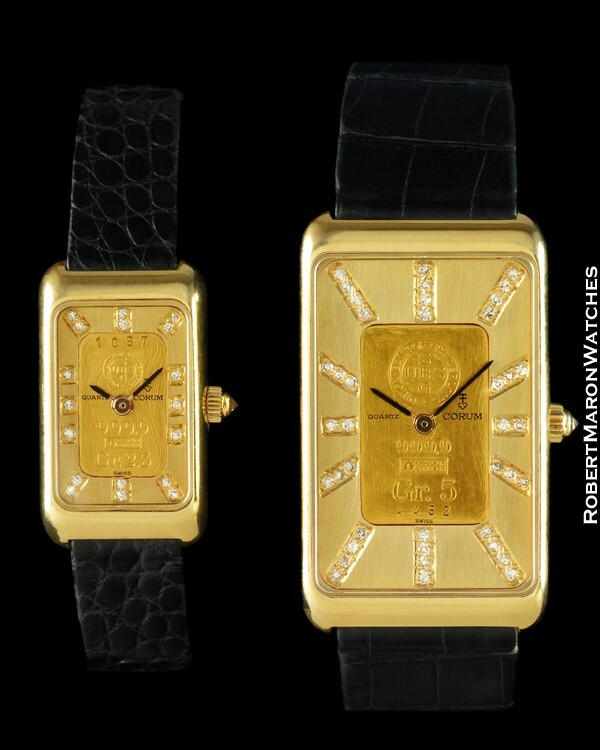 Lady’s watch is a 2.5 gram ingot and men’s is a 5 grams ingot. 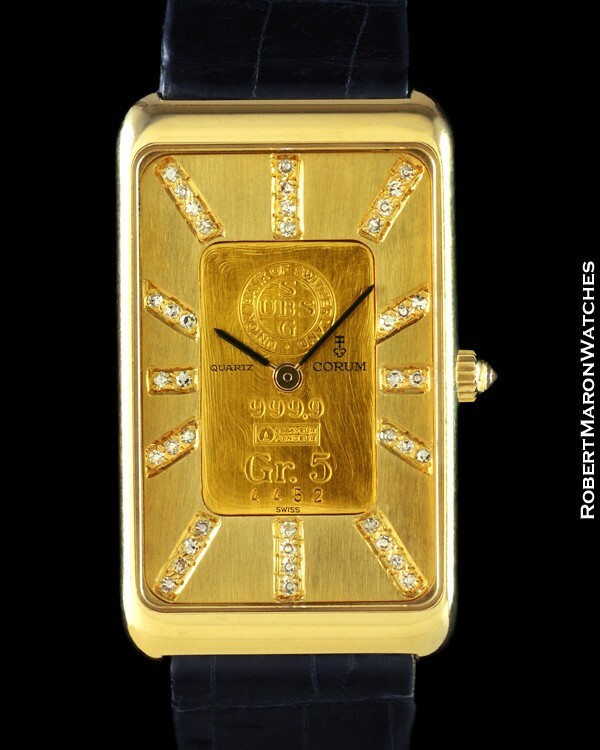 Corum used the ingots to make the watch dials, then formed a watch case from 18k gold which houses the movement, sapphire crystal, and watch crown with diamond cabochon. 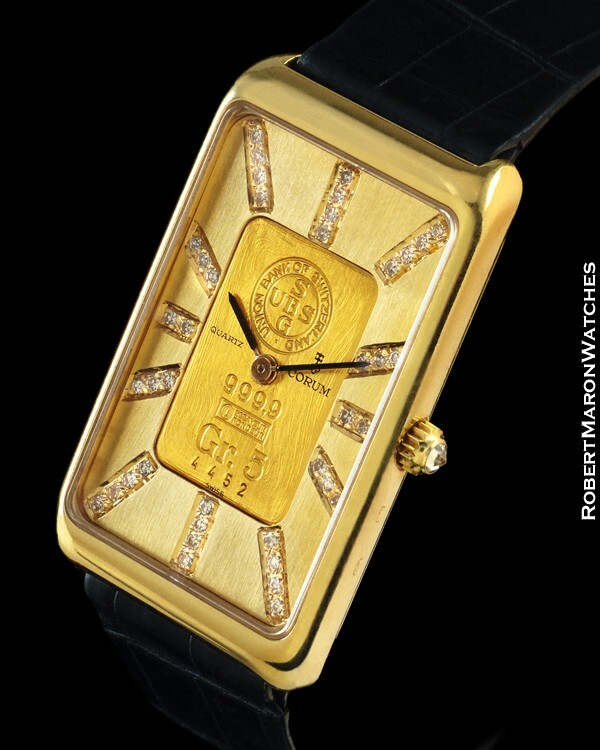 Dial is the actual ingot with the ingot’s identifying information, which Corum signed and also inlaid diamonds for hour markers. 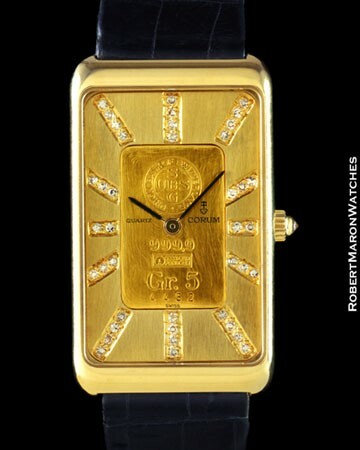 This makes these watches even rarer, since the vast majority of these watches don’t have the diamond hour markers. Men’s watch has dimensions of 40.5mm long by 24.2mm wide by 5.5mm thick. 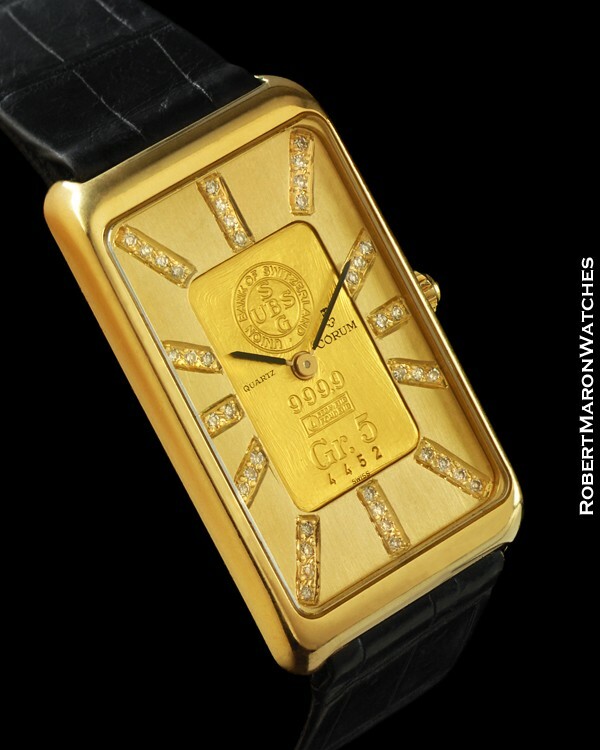 Lady’s watch has dimensions of 26mm long by 15mm wide by 6mm thick. Watches have quartz movements for accurate and trouble free timekeeping. 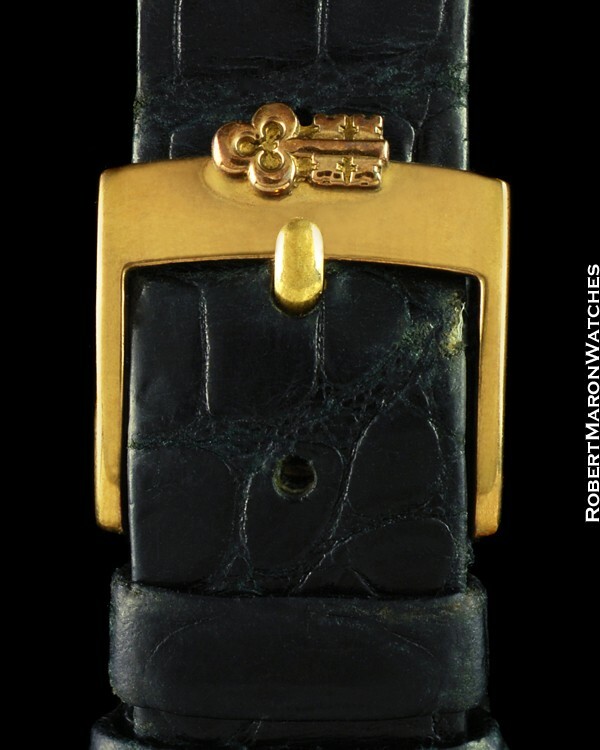 Straps are in very nice condition with original Corum buckles.